THE BRIGGS HOUSE, one of the first-class Hotels of Chicago, was built in 1854 and it, by William Briggs, Esq., whose name it bears. It was opened for guests on the 1st of May, 1855, under proprietorship of Floyd and French. It continued under their charge until March, 1858, when it passed into the hands of the present proprietors, William F. Tucker and Company. 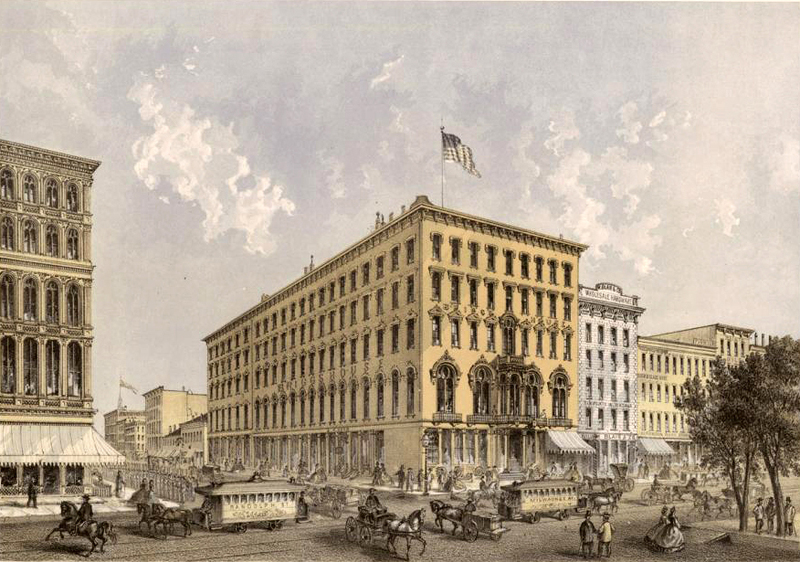 In 1866, the building was raised from its foundation 4 feet 2 inches, to suit the altered grade, and is one of the most complete and aesthetically arranged hotels in the city. The Briggs House has always been celebrated for the comfort, neatness, quiet, and admirable order of its appointments, and also for the excellence of its table and the general hospitality of its proprietors. The rooms are large, well lighted and ventilated, and it can accommodate comfortably 500 guests. The house has recently been refitted and refurnished throughout, and in keeping with the advanced style of the leading hotels of the country. It has a front on Randolph Street of 80 feet, and extends north on Wells Street 180 feet. William F. Tucker and Co., Proprietors; George H. French, Superintendent; William F. Wentworth, Cashier; Fred. Burnham, Clerk.